EUROPE’S biggest trailer maker is helping to power an ambitious British bid to smash the sound barrier and break the world land speed record. Two box vans supplied by Ifor Williams Trailers will play a key role when the supersonic jet car Bloodhound SSC it makes its assault on the current record of 763 mph in South Africa this autumn. They will be used to carry jet support equipment, including inspection and diagnostic technology equipment and server storage for the mass of technical data. Meanwhile, two flatbed trailers will be used to carry large tanks containing oxidizer for the rocket fuel. The trailers will also be used for the eventual attempt to break through the 1,000 mph barrier next year using jet and rocket power. The team assembling Bloodhound in Bristol have also just taken delivery of two other Eventa-style trailers which are touring the UK as part of an educational project updating schools and colleges about the project. 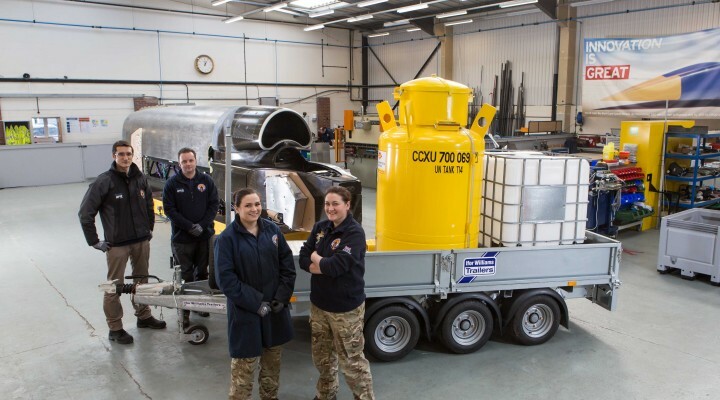 According to leading members of the Bloodhound’s project team, all of the Ifor Williams trailers are playing an important role in the project. Lee Giles, a Bloodhound rocket technician, said: “The Ifor Williams flatbed trailer will play a key role in the World Land Speed Record run. Andrew Reece-Jones, the Design Engineering Manager, at Ifor Williams Trailers, was delighted they were able to help Bloodhound. He added: “Our trailers have been designed to be flexible and they have been called upon to transport many unusual loads but as far as I’m aware we’ve never carried such high tech equipment or rocket fuel oxidizer. 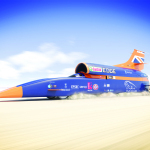 Led by Richard Noble, the man behind the Thrust and Thrust 2 projects, who held the land speed record from 1983 to 1997, the Bloodhound project also involves Andy Green, the pilot who set the current world land speed record at 763mph in 1997. The aim of the project is not only to eventually smash through the 1,000 mph barrier but also to inspire a new generation of scientists and engineers through an education programme surrounding the research, design and buildings of the supercar. With its slender body of about 13.4m in length, the formidable speed machine weighs 7.5 tonnes and the engines produce over 135,000 horsepower – more than six times the power of all the Formula One racing cars on a starting grid put together. Bloodhound has three power plants, a Rolls-Royce EJ200 jet from a Eurofighter Typhoon, a cluster of Nammo hybrid rockets and a 650 bhp Jaguar V8 engine that drives the rocket oxidizer pump. Between them they generate thrust equivalent to the combined horsepower of 180 F1 cars. At full speed Bloodhound can cover a mile (1.6km) – that’s 4.5 football pitches laid end to end – in just 3.6 seconds. The project team scoured the globe to find the perfect desert to run the car on, which needed to be at least 12 miles (19km) long, two miles (3km) wide and perfectly flat. The Hakskeen Pan in South Africa’s Northern Cape was eventually selected by the team. This summer Bloodhound is scheduled to undergo UK runway testing up to 200 mph (321 km/h) at the Aerohub circuit in Newquay, Cornwall. The team will then deploy to South Africa this autumn to begin high speed testing with the target of breaking the current speed record and reaching 800 mph (1,287 km/h). 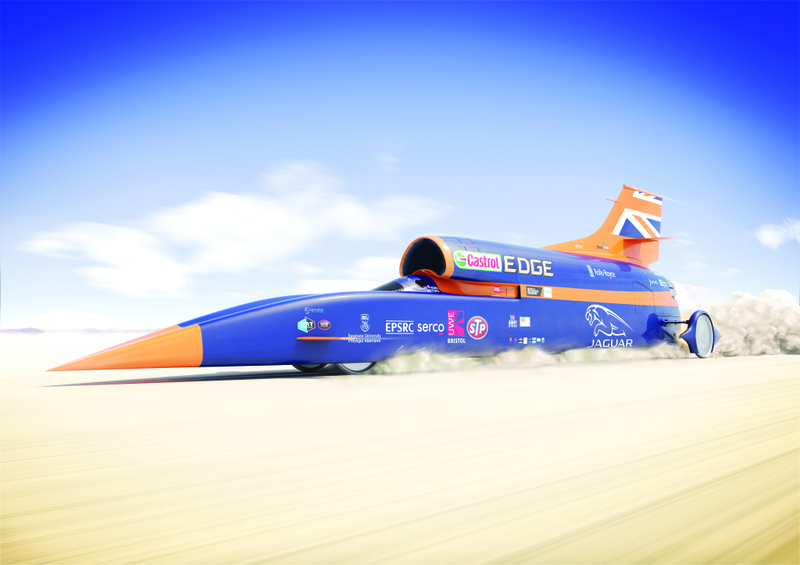 They will come back to the UK to review the data before returning to South Africa in 2016 with the aim of blasting through the magic 1,000 mph milestone. The World Land Speed Record is calculated from the average times of the car over two runs, completed within the space of an hour, and each run uses up a tonne of the liquid oxidiser carried by the Ifor Williams flatbed trailer, which will transported out to South Africa for both the attempt on the existing record and the push for 1,000mph. Aulden Dunipace, the programme director, said: “To date around 5,700 schools and colleges across the UK have signed up to the programme and the two Ifor Williams Eventa-style trailers are a valuable addition to it. “They allow the education team to take a full sized Bloodhound modular show car into schools and colleges as part of the Bloodhound inspiration experience. Aulden explained that each of the two education trailers carries a realistic scale model of the Bloodhound car which can be split in half so that budding engineers of tomorrow can study its complex internal workings. “The car is currently under construction at our Bristol headquarters and will have its low speed testing, up to 200mph, at Newquay in August. “The team will then deploy to South Africa in September or October to begin high speed testing beyond the current record and towards 800mph and in 2016 the team will return to South Africa to go for 1,000mph, and on both these occasions the Ifor Williams trailers will be shipped out to the Northern Cape to be part of that,” said Bloodhound project spokesman Jules Tipler.